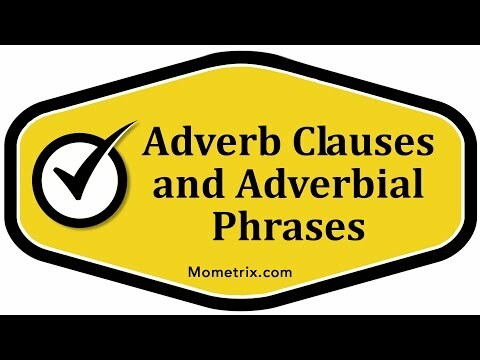 Adverb clauses and phrases are both groups of words that are collectively used to modify the verb of the sentence; however, the two have a distinct difference. Adverb clauses have both a subject and a verb in the modifying text, while adverb phrases do not. Adverb clauses and adverbial phrases are groups of words that play the role of an adverb. Let’s take a look at this example sentence on the board. “When I complete this task, we can go.” The meat of this sentence, the subject and verb of this sentence, comes in the later part of the sentence. “We can go.” “We” right here is the subject and “can go” is the verb phrase. “When I complete this task” could actually be removed from the sentence and the sentence would still make sense. “We can go” makes perfect sense by itself. “When I complete this task” is an adverb, because adverbs aren’t necessarily important to a sentence. You can remove an adverb and the sentence will still make sense without it. Adverbs merely modify or further describe another word in the sentence. Since we can remove “When I complete this task” from the rest of the sentence, then it is probably our adverb clause (it is). There is not one word in this adverb clause right here that it actually would be an adverb by itself. It’s the group of words right here together that modify the verb “can go”, or the verb phrase “can go”, because can and go together make up the verb phrase. “When I complete this task” is our adverb clause and it modifies “can go”. It’s answering the question “when”. When can we go? When I complete this task. Adverbs often answer a question. The question here is “when”, and it’s saying “when I complete this task.” Notice that it’s called a clause. This is called an adverb clause. That’s because clauses contain both a subject and a verb. That is the case with this group of words right here. You see a subject and a verb. “I” is the subject and “complete” is the verb. Let’s look at this next sentence. “In a moment, the pizza will be ready.” Here, the meat of our sentence is in the later part of the sentence. “Pizza” is the subject and “will be” is the verb phrase. Again, “in a moment” could be removed from the sentence. “In a moment, the pizza will be ready.” Now, let’s try reading the sentence without this. “The pizza will be ready.” The sentence still makes sense, so this is probably our adverbial phrase. Notice this time that it’s called an adverbial phrase instead of an adverb clause. What’s the reasoning behind that? The reasoning is that a clause contains both a subject and a verb. A phrase does not contain a subject and a verb. Here, there is no subject and there is no verb. That’s why it’s called an adverbial phrase. This group of words right here, “in a moment”, describes or modifies “will be”. Again, it’s answering the question “when”. When will the pizza be ready? It will be ready in a moment. The important thing to remember is the main distinction between adverb clauses and verbal phrases. Adverb clauses are group of words that modify another word, but the adverbial clause, or the adverb clause, contains both a subject and a verb. In the case of an adverbial phrase, it again is a group of words that modifies another word, but, in this case, the adverbial phrase does not contain a subject and a verb.